Fisherman’s Wharf gets a bad rep as being a bit touristy and tacky but honestly I had the best time there, being on the harbour and watching the boats sail past Alcatraz was something I’ll never forget! 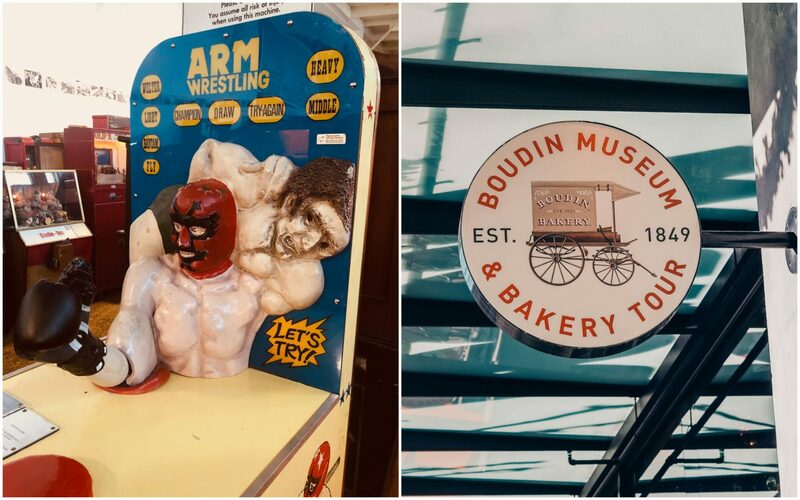 In terms of ‘local flavour’ ok it’s very much a tourist hangout, but funnily enough tourist hot spots generally work well for tourists and I thought I’d share some of my favourites places to spend the day in, in Fisherman’s Wharf. Start your day off right with a big brekkie, the queue outside the non-descript looking Hollywood Cafe on North Point street should tell you all you need to know about the food on offer, go for the french toast and sit outside and watch the cable cars ride by as you people watch. Walk down to Pier 39 and hit the Musee Mechanique, if you’ve watches Princess Diaries (and if you haven’t go and recitfy that now!) then you know this is the place Julie Andrews arm wrestles a vintage arcade machine. Well it’s still there and the whole place is absolutely incredible, filled with original arcade machines and everything costs around a quarter! Leave the museum by the back and you’ll see a massive war ship and a handful of viewing telescopes, they give a completely unmatched view of Alcatraz if you haven’t got time to visit and offer a great view of the whole bay without the crowds at Pier 39! By now you’ll be thinking about a spot of lunch, walk down to Boudin Bakery, the most famous in San Francisco and grab anything, honestly I ate here a lot and everything was good (I especially enjoyed the Chicken Salad on Sourdough with red grapes, delicious!) Pick a table at the front and you’ll catch the afternoon sun and get a great view of the cable cars going past, you’ll also get a prime view of the bread being hand made at the giant windows. 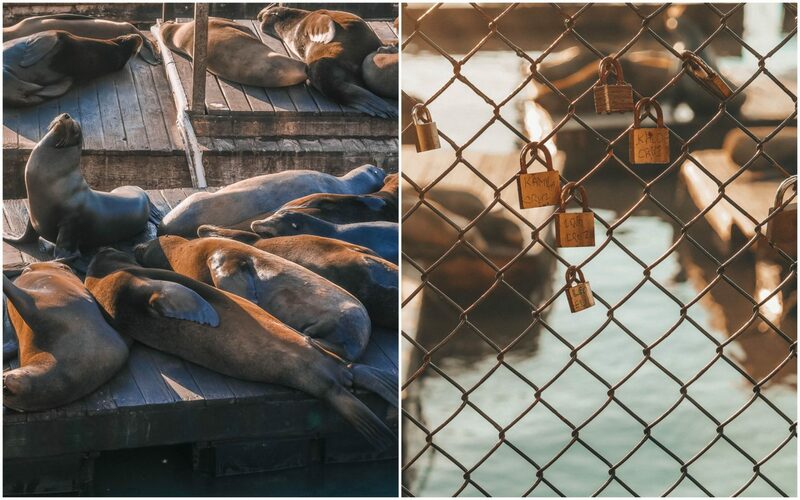 Walk on down to Pier 39 and head straight to the Sea Lions, they arrived after the Earthquake and never left and have become the unofficial San Francisco mascot. They are free to come and go as they please and you’ll hear them long before you see them, it’s usually busy around the pier but you’ll easily get a spot as people move on fairly quickly. If you go back into the Pier area and go upstairs to where the Pier 39 restaurant is you’ll find the information centre, just behind this is the back of the restaurant and a completely empty area with some of the most incredible views of Golden Gate bridge and Alcatraz, every time we went there it was empty (I think it’s really a staff area but it wasn’t closed off) and the view is spectacular, great for photo opps! Grab a coffee from the street vendors and walk straight through the pier area and you’ll come across a little platform with picnic style tables and unobstructed views of the bay, the perfect place to watch the sun set. If you’re staying at the Pier for dinner then head to Pier 39 restaurant for a bread bowl of Clam or Crab chowder, if you’re wanting something less formal then head back towards the Musee Mechanique where you’ll find a ton of shacks selling freshly caught Crab sandwiches (the crab being freshly caught not the bread!) and chowders you can eat by the pier. I’d definitely recommend spending the day at Pier 39, it has a great atmosphere and is probably one of my favourite places in the City. If you get the chance to take a cruise (especially a sunset one) then I’d definitely recommend that you do, there are a ton of companies offering them and are relatively inexpensive. The bay is truly magical and seeing the Golden Gate Bridge and Alcatraz from the water is something truly special. A Weekend In London – mini guide! 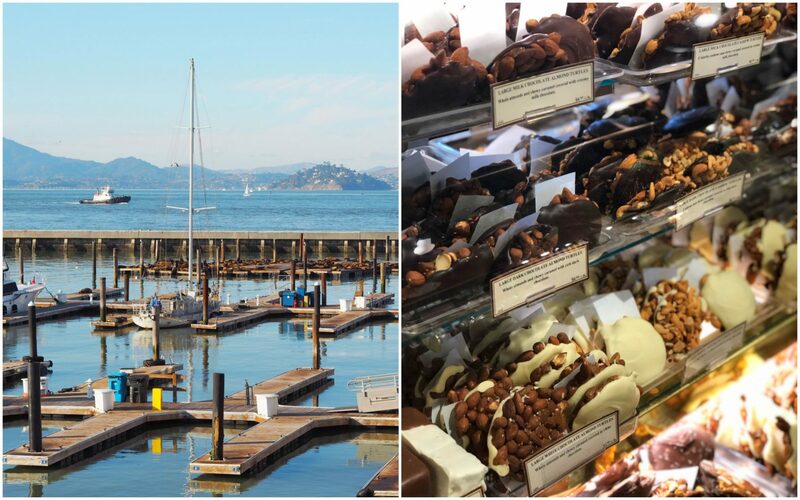 I mostly loved the salt water taffy shops at Pier 39! I have a soft spot for it hope you had a fantastic trip, you’re making me miss the west coast!